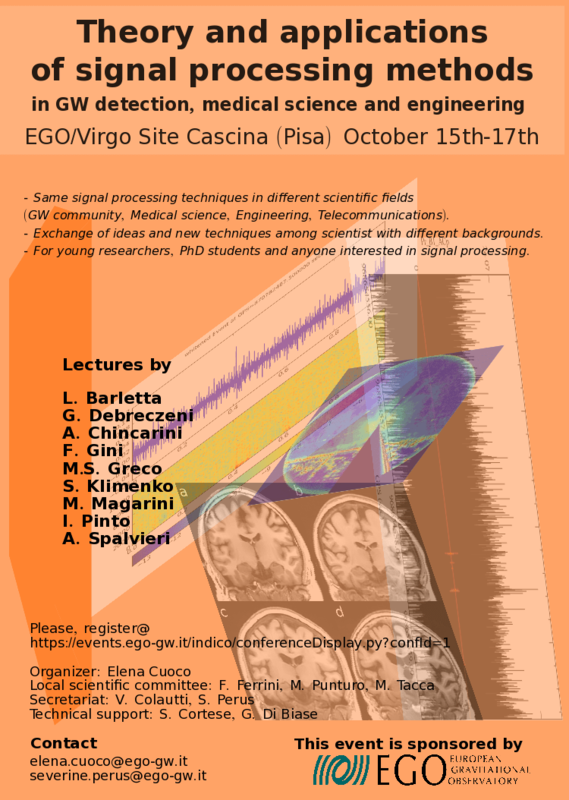 October 15 – 17, 2012 – at the European Gravitational Observatory (EGO), site of the Virgo interferometer in Cascina, Italy. Different scientific environments (GW communities, Medical Science, Engineering, Telecommunications, ..) use the same techniques of signal processing. The aim of this workshop is to put in contact scientists coming from these different fields in order to enhance the exchange of ideas and to bring them to learn new techniques. The program of the workshop covers a wide range of topics such as Gaussian stationary noise, Detection of known signals in GSN, Parametric (Maximum likelihood estimation) and non parametric detectors .. etc. The lectures will be given by foreign and Italian experts having a deep knowledge of their respective field. In addition to the scientists already involved in signal processing, the workshop is also addressed to young researchers, PhD students and more widely, to anyone wishing to update their knowledge of signal processing. Participation is subject to inscription through the workshop website and free of charge.